In my last post, I wrote about a recent Yellowstone press release describing how park gill-netting operations removed 300,000 lake trout from Lake Yellowstone this past summer, and briefly discussed the history of fisheries management in the world’s first national park. Today, I’ll take a look at how lake trout were discovered in Yellowstone Lake, why they’re a problem, and what the National Park Service hopes to achieve in gillnetting as many trout as possible. On July 30, 1994, an angler caught a white-spotted fish, just shy of 17 inches long, in Yellowstone Lake. The accompanying guide identified it as a lake trout, a species previously undocumented in Yellowstone Lake, and notified park rangers. Less than a week later, a second lake trout of similar size was caught and reported. As news of the find hit the media, more people came forward to report that they too had caught non-native lake trout in Yellowstone Lake. Human activities have already reduced its range to 15% of its historic distribution. The appearance of lake trout in Yellowstone Lake has ominous implications for the continued viability of the Yellowstone cutthroat trout as a subspecies. … The predicted decline of Yellowstone cutthroat trout will destroy the world-famous fisheries in the lake and its tributaries, including the storied fishery in the Yellowstone River between the lake and the Upper Falls. … The cutthroat trout decline will also cause severe disruption in the food supply for two species listed under the Endangered Species Act—the threatened grizzly bear and the endangered bald eagle—and will likewise affect many species of special concern, including the white pelican, otter, black bear, mink, osprey, and loon; an estimated 42 species of mammals and birds in all. Grizzly bear, white pelican, and osprey abundance at Yellowstone Lake, and perhaps other species as well, are all correlated with the abundance of Yellowstone Lake cutthroat trout. Because of pronounced differences in the habits and habitat uses of lake trout and cutthroat trout, the lake trout will not serve as a replacement food source for these affected species of mammals and birds. Part of the problem with lake trout is that they occupy a different niche than cutthroat: you’re not just trading out one species of fish for an ecologically equivalent one. Cutthroats swim up into shallow streams each year to spawn. There, they are a readily-accessed food source for numerous other species in Yellowstone. The park’s grizzly bears, bald eagles, otters, pelicans, and osprey all feed on the cutthroat. Lake trout, in contrast, are deep-water dwellers; they are not as accessible a food source. In effect, they end up being a dead end in the food chain. With a surface area of 131.7 square miles and a maximum depth of around 410 feet, Yellowstone Lake is a big place. There’s a lot of room for lake trout, and the invaders have thrived. But all those growing fish need something to eat. They feed on what’s handy: smaller fish. An average lake trout may consume 41 Yellowstone cutthroat trout in a year. 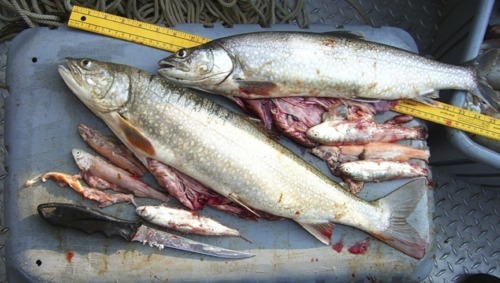 In this NPS photo, undigested cutthroats are shown next the the lake trout that devoured them. Trout numbers for spawning creeks around the lake tell the story best. Pelican Creek, a stream once famous for its trout fishing, had 30,000 spawning cutts in the 1980s; in 2004 park fishery biologists found nine—yes, nine—fish. During the 1970s more than 70,000 fish spawned in Clear Creek; in 2005 biologists found 917. In 2000 they counted 2,500 spawning cutts in Bridge Creek; in 2005, they found one. Recognizing from the beginning that the lake trout were a serious threat to cutthroat and the integrity of the food web, Yellowstone National Park began lake trout control efforts almost right away. More aggressive gillnetting started in 1998. (If you’re curious about how the process works, take a look at Preservation of Yellowstone Lake Cutthroat Trout.) In 2007, the nets snared 74,038 lake trout. Just five years later, in 2012, the catch had increased more than fourfold. The total number of lake trout removed from Yellowstone Lake since 1994 is now over 1.1 million. The goal of the gillnetting is not complete eradication of lake trout. Instead, the Park Service hopes that the lake trout population can be knocked back enough to give cutthroats a fighting chance. And there are now some signs that the massive lake trout removal operation may be starting to pay off: this year, counts of juvenile cutthroats were up. Check back in a few days for the next installation of Something’s Fishy in Yellowstone Lake, when I address other threats to cutthroat trout and think about the larger implications of the lake trout invasion. In the meantime, I’d like to hear from you: what do you think about the park’s lake trout control efforts?